The race for WCHA regular season champions just got a little more interesting, as a weekend split by the No. 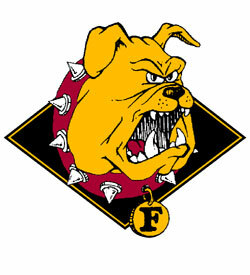 4 ranked Ferris State Bulldogs has allowed Minnesota State to tie them for first place atop the standings. Friday's action against Bemidji State was that of a slow burn, with the majority of goals being scored in the final period. The Bulldogs grabbed a 1-0 lead at the 8:34 mark of the first on a shot from the point by defenseman Travis White, which came off a nifty kick pass by forward Matt Robertson. Also earning a helper on that play was forward Kenny Babinski, who dug the puck out of the corner after White's initial shot went wide. Ferris State built upon their lead early in the third, as Brandon Anselmini fired a pass toward center ice for Corey Kane, who took it into the Beavers' zone with Justin DeMartino in tow. From there, Kane skated in on the right wing and went stick-side to beat goaltender Jesse Wilkins. Radoslav Illo broke Bemidji State's scoring drought on a breakaway goal with 13:23 elapsed, only to have DeMartino return the favor a mere 23 seconds later on a redirected shot from just outside the crease. Freshman forward Chad MacDonald added an insurance goal for the Bulldogs with 22 seconds left, firing an off-balance shot from the red line that split through two defenders and found its way into an empty net. Goaltender C.J. Motte recorded 25 saves to notch his 20th win of the season, while Wilkins had 27 stops to his credit. In the series finale, both teams flipped the script, with action being more plentiful in the first period. The Beavers were able to light the lamp twice within a five-minute span, beginning with Illo's second goal in as many nights just 1:57 into the contest. Markus Gerbrandt added an insurance goal just shy of the seven-minute mark, sneaking the puck past Motte off a pass from Brendan Harms. Ferris State responded late in the period, as Gerald Mayhew and DeMartino helped set-up Kane's ninth goal of the campaign, stretching his goal streak to four games. The score would remain the same the rest of the way, as Bemidji State snapped the Bulldogs' four-game win streak in the process. Andrew Walsh stopped 32 shots to improve to 7-11-4 as a starter this season for the Beavers. At the other end of the ice, Motte (20-5-3) was able to string together a 15 save performance. Ferris State (21-7-3 overall, 16-4-2 WCHA) returns to Big Rapids this weekend for a two-game slate against third-place Alaska-Anchorage in what will be their only meeting of the regular season.